Why Didn't 'The Nightly Show' Connect With More Viewers? Larry Wilmore's Not Sure The Nightly Show has had some viral moments, but had a hard time building ratings. It will air for the last time on Thursday; Wilmore says he feels the show was overlooked by Comedy Central. The last episode of The Nightly Show with Larry Wilmore will air this week. 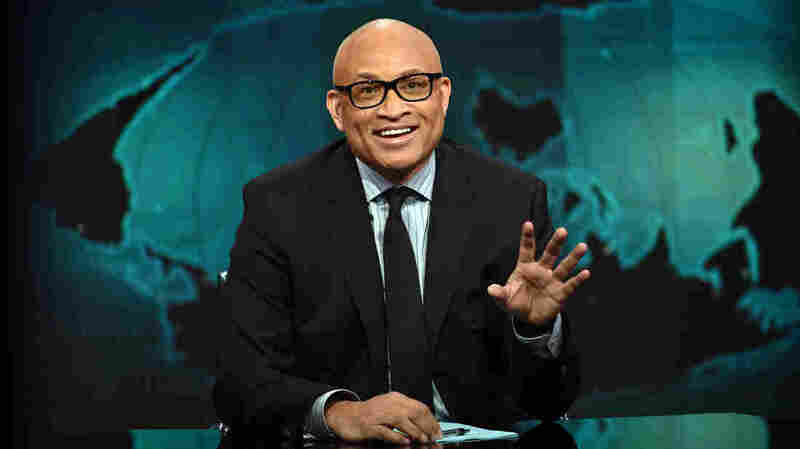 Larry Wilmore isn't sure why his program The Nightly Show failed to connect with viewers strongly enough to survive. But he's pretty skeptical of one notion: That America couldn't handle a black host leading a late night talk show. "I'll do jabs and make jokes [about that], but no ... I don't think the color of a host affects the viewers like that," he says. "Is it a mainstream show in the vein of [NBC's Jimmy] Fallon or [ABC's Jimmy] Kimmel? No, it's not. It is a niche show." Wilmore says Comedy Central called last week to notify him that the show would end on Thursday. But as The Nightly Show prepares to air its finale episode, a potent question emerges: Will TV executives use this as an excuse to say that non-white hosts or frank talk about race can't work on late night TV? Wilmore even made an oblique reference to the racial dynamics of his cancellation in his official statement on the cancellation, noting, "... I'm also saddened and surprised we won't be covering this crazy election or 'The Unblackening' as we've coined it ... I guess I hadn't counted on 'The Unblackening' happening to my time slot as well." Kent Alterman, Comedy Central president, said in an interview shortly after the cancellation was announced that contracts for Wilmore and over a dozen other key staffers were coming up for renewal, so the network had to make a decision on the show's future now. They had a program getting low ratings and little buzz online. According to Comedy Central's numbers, The Nightly Show placed seventh among late night shows among viewers ages 18 to 34, even behind @midnight, the game show that currently airs on Comedy Central after The Nightly Show, and which will now replace it. Wilmore's only direct criticism of Comedy Central is that he felt his show was overlooked as the channel focused on newcomer Trevor Noah, who succeeded Jon Stewart as host of The Daily Show just nine months after The Nightly Show debuted. "To me, I didn't feel like there was enough synergy between our two shows, where we could have been promoting each other," he says, shrugging off the question of whether his show was treated fairly. "It's television. When you use the word 'fair' in television, you're already in a fantasy world. Nothing is really fair in television." The fact is, a bunch of factors helped kill The Nightly Show, including its inability to turn signature stuff like The Unblackening and "Keep it 100" — a bit encouraging celebrity guests to be painfully honest about controversial questions — into viral moments shared online. Wilmore is an engaging and incisive host. His commentaries and observations that open each show were often a highlight. But the show was also conceived as a loose parody of newsy panel programs like Meet the Press, featuring its own jokey panel of contributors dissecting topics with a celebrity guest. Too often those segments lacked notable stars or compelling discussions. And comedy bits featuring the show's cast of contributors often didn't jell, either. It's easy to underestimate how much time it takes for a late night show to find its voice. Stephen Colbert, whose departure from Comedy Central's The Colbert Report in 2014 opened the 11:30 p.m. time slot for Wilmore, still seems to be struggling to hit his stride on CBS' The Late Show (though his brilliant live shows after the Democratic and Republican conventions were a giant step forward). Viewers have been spoiled by the immediate creative success of The Daily Show alums John Oliver on HBO's Last Week Tonight, Samantha Bee on TBS' Full Frontal and even Colbert, who coined the classic term "truthiness" on his very first episode of The Colbert Report. It took years for late night stars like Jon Stewart, Conan O'Brien and Jimmy Fallon to find their voice — a feat comparable to changing the tire on a car while driving it. The real measure of equality in Hollywood will be when non-white stars get the same resources and latitude as white hosts, being allowed to experiment with staff and being given several years to fail, to improve, to find their voice. With less than two years under its belt, The Nightly Show, arguably, didn't get quite enough of either. It's television. When you use the word 'fair' in television, you're already in a fantasy world. Nothing is really fair in television. Still, Wilmore says the show found its voice right away, citing his commentary on sexual assault allegations against Bill Cosby delivered in the second episode. "We'll answer the question did he do it?" Wilmore says in the show's opening moments. "The answer will be yes." Wilmore was also trying to succeed at the same time Comedy Central installed Noah, who is black and South African, as Stewart's successor on The Daily Show. Noah took over in fall 2015 and his dive in the ratings at 11 p.m. left fewer viewers to stick around for Wilmore at 11:30 p.m. A stronger lead-in could have helped The Nightly Show stabilize. Cynics might say the channel was trying something too difficult, replacing beloved stars like Stewart and Colbert with the only two non-white people currently hosting late night TV shows. And of the two hosts, Noah, at age 32, better fit the picture of a host who appeals to the channel's millennial target audience — people who rarely watch any "linear" TV when it airs. Comedy Central's president Alterman says he always saw The Nightly Show's diversity as "a great attribute" of the show, though says, "our audience makes the decision" about which shows get canceled by not showing interest. But after the departure of Key & Peele last year, The Nightly Show is the second high-profile Comedy Central series which talks often and directly about racial issues to leave the air. The game show @midnight, hosted by geek guru Chris Hardwick, will take The Nightly Show's place in the short term. And it's not inconceivable that, if Hardwick's show succeeds there, it may stay awhile, despite Comedy Central's intentions to develop another show for that timeslot in early 2017 — and despite the fact that the show is called @midnight and will air at 11:30pm. Which means that, if Comedy Central hopes to continue The Nightly Show's multiculturalism and take it to another level, they're going to have to commit to trying again. They're going to have to find a new talent and give him or her the same shot at success that all the white guys hosting talk shows have gotten. In a world where #BlackLivesMatter and racial issues often top newscasts, it seems like a no-brainer.